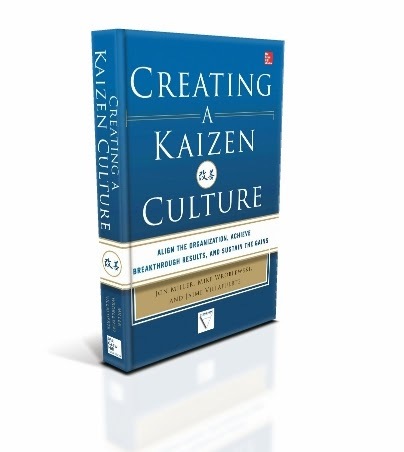 Lean and Meaningful: Creating Leaner Value Streams: Are the pacemaker and the bottleneck the same? 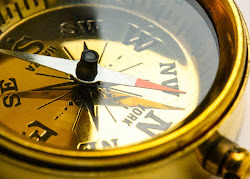 When designing leaner value streams, one key step is to define where to locate the pacemaker. However, a common misconception is to believe that the bottleneck process is the pacemaker. While a pacemaker could coincide with the bottleneck process, they mean different things. The bottleneck is the constraint process in your value steam that defines your actual throughput capacity. The bottleneck will define if you can or cannot meet your customer demand. For instance, if you have four processes as shown in the figure to the right, the bottleneck is process 2. 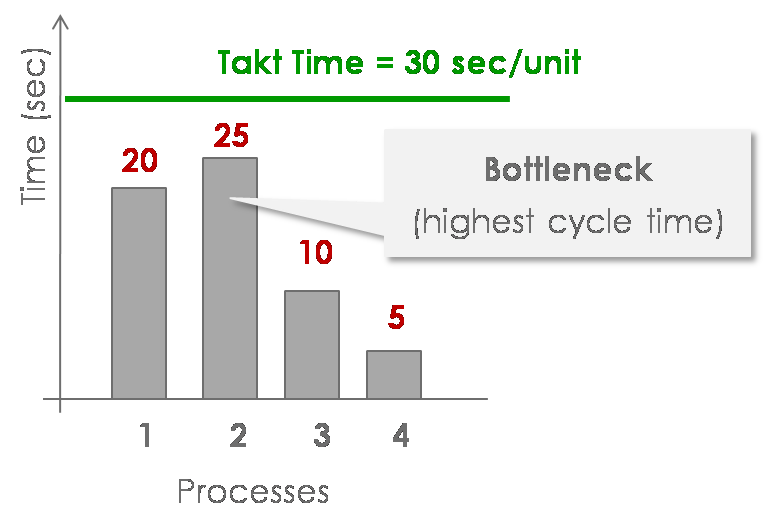 Notice that the takt time is greater than the bottleneck. If the bottleneck cycle time (the highest cycle time in your value stream) is greater than the takt time, then we are not able to meet customer consumption. If it is lower, then you have overcapacity (waste). The pacemaker is the single scheduling point in your value stream. It sets the mix of products to produce in order to meet customer demand. Because it is the scheduling point, the pacemaker is then the point in which push flow starts and pull ends. 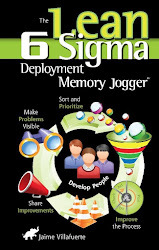 Can we meet customer demand? 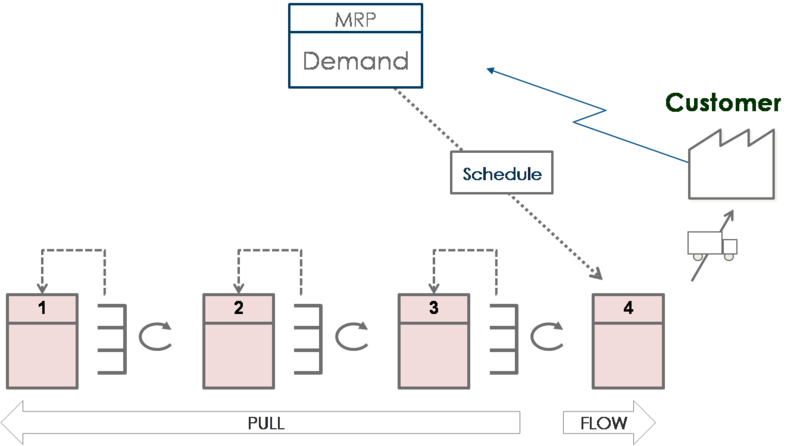 Answer this question by comparing the bottleneck throughput to the required throughput. In other words, we compare the takt time to every process cycle time, including the bottleneck process, to ensure that the consumption rate can be satisfied with the production rate. 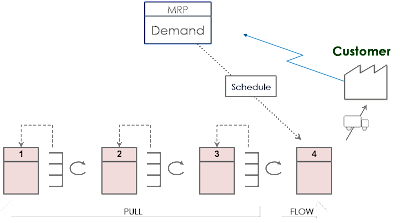 Can we use flow in our value stream? Ask this question at each process, starting at the end of your value stream and going upstream, to identify the pacemaker. If the answer is not, then that specific process is the pacemaker. In conclusion, bottleneck is about throughput while pacemaker is about flow and pull. Value stream design not only requires to focus on the right problem, but also to do it at the right time and following the right order. 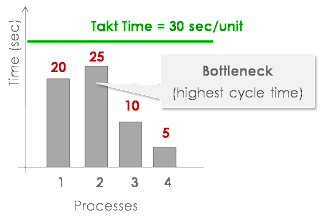 Start with takt time to balance each of the processes, including the bottleneck, with two objective: (1) you are able to meet demand (enough capacity) and (2) remove unnecessary resources (too much capacity). Only when this first step is completed, you can focus on creating flow by setting your pacemaker. Why is the pacemaker important? Thank you for this excellent post. I have just started to read this article carefully. Keep up posting these type of post continuously. With the Green Belts training, they are able to understand the benefits and gains out of the project success.